British troops patrol the new border in 1922. As part of an outreach programme supported by the UK Lottery’s Heritage Fund, the Cardinal Ó Fiaich Library and Archive (COFLA) in Armagh hosted a one-day conference on Saturday 14th November,. Kieran Glennon, author of “From Pogrom to Civil War: Tom Glennon and the Belfast IRA” reports on the event. The north of Ireland is often overlooked in the history of the Irish revolution of 1916-23. Often it disappears from histories after the Home Rule crisis of 1912-13, as if that episode when the Ulster Volunteers resisted Home Rule was inevitably followed by partition. In fact the north, and in particular the six counties that became Northern Ireland under the Government of Ireland Act of 1920, saw some of the worst violence of the period, with up to 800 deaths in all Ulster counties between 1920 and 1922. In Belfast, Catholic folk memory remembered it as the ‘pogrom’ in which their community was attacked by both the loyalists and the state. For all that, unlike the south where republicans could look back on aspects of the independence struggle and remember them as a glorious victory, for northern republicans there was only defeat and disappointment. For this reason the story of the north during the revolutionary period has been little discussed. This conference held in Armagh in November 2015 sought to remedy that. COFLA is the repository for one of the most unique archival collections relating to the War of Independence and Civil War. 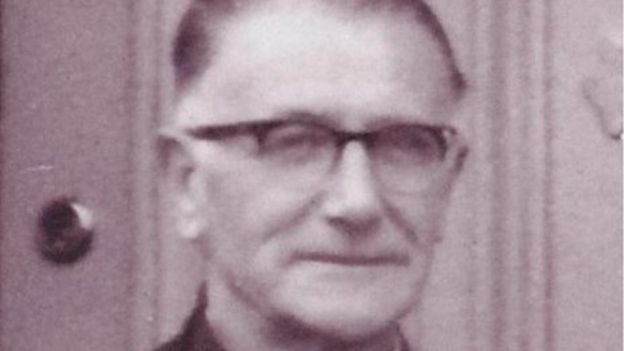 Beginning in the early 1960s and continuing until 1971, a South Derry-based priest, Fr Louis O’Kane, recorded a series of interviews with northern veterans of the 1913-23 period, including members of the Irish Volunteers / IRA, Cumann na mBan and Sinn Fein. Opening the day’s proceedings, Dónal McAnallen of COFLA gave an overview of Fr O’Kane’s life and remarkable collection. Benefitting from both the trust that would ordinarily have been placed in a priest and also from family connections to the veteran Belfast republican Seamus Dobbyn, Fr O’Kane was able to encourage veterans to open up to him and recount their experiences and memories; word evidently spread on the veterans’ grapevine that he could be relied on to keep his recordings confidential and so he eventually ended up interviewing 75 veterans. Fr Louis O’Kane, recorded a series of interviews with northern veterans of the 1913-23 period, including members of the Irish Volunteers / IRA, Cumann na mBan and Sinn Fein. When the Northern Ireland ‘Troubles’ began in 1969, Fr O’Kane was so concerned that the tapes might fall into the hands of the northern authorities that he handed them over for safe keeping to a fellow priest living south of the border in Monaghan. After Fr O’Kane died in 1973, the collection was passed on to Fr, later Cardinal, Tomás Ó Fiaich. A process of digitising these recordings was begun in 2001 and since 2013 the collection has been open to the public. This process of digitisation is still in progress, owing to the sheer size of the collection – for example, there are 17 tapes of interviews with Seamus Dobbyn alone. Eve Morrison of UCD, author of a forthcoming book on the Bureau of Military History and currently researching the Ernie O’Malley notebook interviews, drew comparisons between the O’Kane Collection and these two better-known oral history collections. She pointed out that the BMH collected relatively few witness statements by northern veterans – there are less than twenty from former members of the 3rd Northern Division, even though Belfast was still the second-largest city in the country – and that the process of collecting more statements in the north was abruptly ended by the outbreak of violence in 1954, when several RUC barracks were attacked. The Ernie O’Malley interviews focussed mainly on the post-Treaty period, so the O’Kane Collection represents an especially important resource in relation to the period leading up to the Truce of July 1921. She stressed the unique value of having the audio recordings which capture the full tone of the interviewees’ responses to Fr O’Kane’s questions. She also made the point that Fr O’Kane benefitted greatly from the assistance of John McCoy; originally Adjutant of Frank Aiken’s 4th Northern Division, McCoy had been centrally involved in both the Military Service Pensions applications of the 1930s and later as the interviewer who conducted the majority of the BMH’s interviews with northern IRA veterans. As a consequence of McCoy’s involvement, the O’Kane Collection also contains a mass of documents relating to both the MSP applications and the BMH witness statements, as well as many contemporary documents relating to the 2nd Northern Division – its final O/C, Tom Morris, was another of Fr O’Kane’s interviewees. 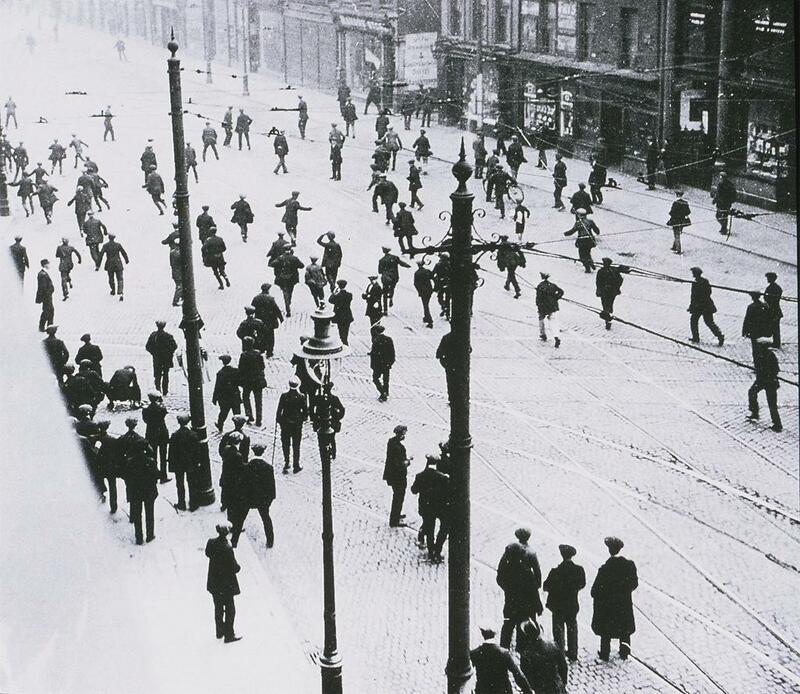 A street riot in in Belfast. The next session focussed on the areas of responsibility of the 2nd and 3rd Northern Divisions, both of which operated entirely within what was to become Northern Ireland..
Fergal McCluskey of Coláiste Feirste, author of “The Irish Revolution 1913-23: Tyrone” used the case of Alice Mallon to illustrate the difficulty of arriving at sound historical conclusions when faced with conflicting sources. Mallon was a leading activist in the Tyrone Cumann na mBan and perhaps not surprisingly, was described as a “very bad woman of the worst class” in an RIC report. She was arrested for her activities in 1921, but McCluskey drew attention to a note in her police file that suggested her arrest, by weakening Sinn Féin in the county, might help the constitutional Nationalist Party in its campaign for that year’s General Election. He also highlighted the perils of an interviewer who “knows” less than he imagines but then attempts to lead a witness. 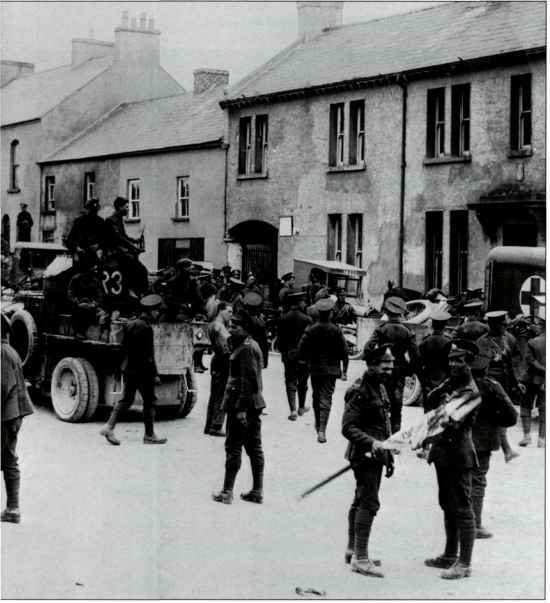 Mallon’s two brothers had mobilised in Coalisland for the Easter Rising; however, Fr O’Kane was aware that no company of the Irish Volunteers had existed in Ardboe, where the Mallons lived, prior to 1919. The conference was treated to a fascinating excerpt from the interview where he attempted to persuade her that she was mistaken in relation to her own brothers’ involvement in 1916, while she insisted her memory was not at fault. Not wanting to attribute too much infallibility to police files. McCluskey pointed out that while the RUC believed that Mallon’s two brothers were on the run in the summer of 1922, they were in fact serving in the Free State Army at the time. In some ways, this was unsurprising, as the papers held in the Public Record Office of Northern Ireland (PRONI) are very much the archive of the unionist regime from late 1921 and thus reflect the thinking and erroneous assumptions of the authorities. As a counterweight, he advocates a process of “triangulation” between oral testimony and primary source material in order to determine historical facts. The next speaker was Jim McDermott, the author of “Northern Divisions: The Old IRA and the Belfast Pogroms 1920-22”. He cited the accounts of Seamus Dobbyn and Liam Gaynor, each of whom gave interviews both to the BMH and to Fr O’Kane. Both men were far more forthcoming about their activities prior to and during the Easter Rising, when not a lot actually happened in the north, than they were about the events of the 1920-22 pogrom; he felt this hinted at a certain level of discomfort on their part after the cosy clandestine plotting of the middle-class pre-1916 IRB was replaced by more visceral street violence in the 1920s. It was particularly strange that Liam Gaynor had relatively little to say about the latter period given that his brother Sean was one of the first victims of the RIC “murder gang” in September 1920. His talk also looked at the connection between the Belfast IRA and Michael Collins, who was a TD for Armagh in the Second Dáil.. According to Gaynor’s interview with Fr O’Kane, Collins initially considered northerners’ accounts of the violence meted out to nationalists in the city as “exaggerated” and declined invitations to visit the city to see for himself. However, Gaynor’s recollection may have been biased – Collins’ decision to end the Belfast Boycott, of which Gaynor had been the director, as part of the first Craig-Collins Pact, so incensed Gaynor that he later tried (unsuccessfully) to join former 3rd Northern Division O/C Joe McKelvey in the Four Courts garrison. Michael Collins dispensed created the Belfast City Guard in early 1922, with 72 officers and men paid a relatively generous weekly wage to become full-time IRA activists. McDermott said that in order to maintain the loyalty of the Belfast IRA, Collins dispensed “largesse” to them – he cited the example of the Belfast City Guard which was established in early 1922, with 72 officers and men paid a relatively generous weekly wage to become full-time IRA activists. In relation to the disastrous Northern Offensive of May 1922, he said that what Dobbyn and Gaynor failed to appreciate was that Collins was acting according to the demands of realpolitik – while he was sympathetic to the plight of northern nationalists, consolidating the position of the Provisional Government in the south against the anti-Treaty IRA took precedence. So instead of the offensive being a full-scale rising combined with an invasion across the border, the 2nd and 3rd Northern Divisions, each based entirely in the north, were left to fight alone. The theme of tainted southern “largesse” to the northern IRA was revisited in the question-and-answer conclusion to this session. Fergal McCluskey referred to the replacement of Charlie Daly as O/C of 2nd Northern Division in March 1922 – he had complained when arms sent north, intended for his division, were instead siphoned off for the 5th Northern Division, of which Chief of Staff Eoin O’Duffy had formerly been O/C. 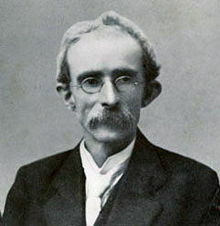 O’Duffy then replaced Daly with another of Fr O’Kane’s interviewees, Tom Morris – this had the added advantage for the pro-Treaty regime of replacing an outspoken opponent of the Treaty with a more compliant officer, thus tightening the grip of the Provisional Government over the northern IRA. The keynote address of the conference was given by Helen Litton, a grandniece of both Kathleen, wife of 1916 Proclamation signatory Tom Clarke, and of Ned Daly who commanded the Four Courts garrison during the Easter Rising. She gave an outline of the lives of both Tom Clarke, who grew up in Dungannon, and of Kathleen, whose father was prominent in the IRB in Limerick. Kathleen Clarke was also interviewed by Fr O’Kane. In a section of the recording played to the conference, she described the couple’s time together in the USA with wistful sadness as the only time she was truly happy. This idyllic period came to an end in 1907 when her husband felt compelled by the growing crisis in Europe to return to Ireland to further the republican cause – the remainder of his life, culminating in execution after the Easter Rising, is well known. What is less well-known is that Kathleen was one of the few women sworn into membership of the IRB as she was convinced that it was her mission to continue her late husband’s work. She later joined Fianna Fail, and became the first female Lord Mayor of Dublin, though she had scant regard for sticking to the party line and little respect for party founder Éamon de Valera. 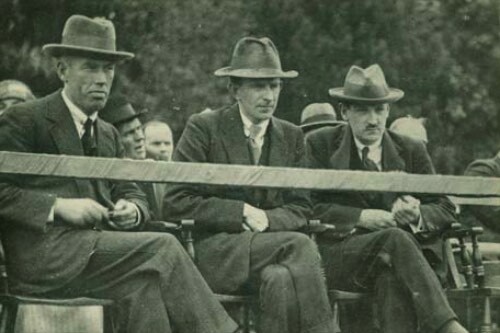 Michael Collins, Eoin O’Duffy and Eamon Donnelly in Armagh in 1921. Not surprisingly, given the location of COFLA, the next session focussed on the county of Armagh. In a talk entitled “Sedition in Isolation”, local historian Eoin Magennis outlined the life of Charles McGleenan, who was from Blackwatertown in the predominantly unionist north of the county. He was involved with the Irish Volunteers from 1914 and took part in many of the actions carried out by the IRA’s Armagh Battalion of which he became O/C in 1922. Interestingly, he was determined to remain neutral when the IRA split in the spring of 1922; when the 4th Northern Division established a training camp at Castle Shane in Monaghan, he was put in command. However, his neutral stance cut no ice with the Free State Army who raided the camp in July of that year – McGleenan was interned in Hare Park Camp in the Curragh until 1924, not finally returning home until 1926. McGuill’s pub in Dromintee, saw a B Special attack in 1922 that prompted the Altnaveigh massacre by Frank Aiken’s 4th Northern Division in revenge. Magennis pointed out that Fr O’Kane’s interviews with McGleenan demonstrated the priests’s tendency to editorialise at length, but equally that the veterans were not beyond nodding politely and continuing their own train of thought. The final talk was given by another local historian, Kevin Murphy, who recalled old veterans calling to swap stories of the revolutionary period with his father during the 1950s. Using a vast range of photos from both the O’Kane Collection and his own, he painted a fascinating picture of the complex network of ties that connected the members of the South Armagh IRA, not just at that time but also extending into the modern Troubles. The existing family connections between brothers and cousins were supplemented and reinforced by marriages between members of various republican families. However, the connections that Murphy outlined did not only involve people. He pointed out that McGuill’s pub in Dromintee, where a B Special attack on the family killed two men and saw a gruesome sexual assault on a woman, prompted the horrific Altnaveigh massacre perpetrated by Frank Aiken’s 4th Northern Division, in which 6 Protestant civilians were were shot dead. The pub was later rebuilt as the Three Steps Inn; this was the last place British undercover officer Captain Robert Nairac was seen in May 1977 – he was presumed to have been abducted and killed by the Proovisional IRA. The final session of the conference consisted of a round-table discussion involving sons and daughters of some of the veterans that Fr O’Kane had interviewed, chaired by Eunan O’Halpin of TCD. A common theme, expressed by the sons of both Frank Aiken and John McCoy, was that of their fathers’ reticence – the events of the revolutionary decade were rarely if ever discussed, and even then only with fellow-veterans but not with family members. Compared to the vast amount of literature concerning the more recent Troubles, the history of the north from 1913-23 remains under-written. Perhaps the most poignant contribution of the day was provided by a son of Elver Monagahan, a former member of 4th Northern Division. Like the others, his father had seldom talked about the period, but now, thanks to Fr O’Kane’s recording, he could listen to his father telling his own story in his own voice. Compared to the vast amount of literature concerning the more recent Troubles, the history of the north from 1913-23 remains under-written. The resistance of unionism to Home Rule has been well well-documented, with notable additions in recent years prompted by the centenary of the Ulster Covenant. In contrast, there are no more than a few dozen books that focus specifically on the history of nationalist Ulster in this decade. The O’Kane Collection at COFLA represents an important resource that should help that history to be developed. The conference struck a fine balance between highlighting the extent of its holdings and pointing out the failings to which oral history can sometimes be prone. The need to be conscious of what is not discussed as much as what is, and to find other means of bringing uncomfortable truths into the light, represents an interesting challenge for future historians of the north in this period.